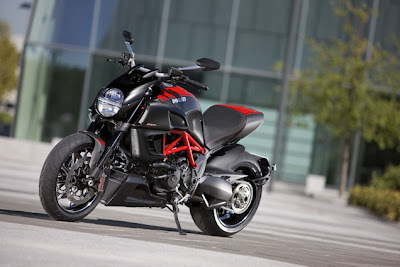 The Ducati Official website has been updated... the new Ducati Diavel has been officially launched. 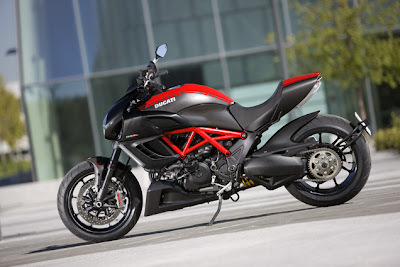 To be honest, the Diavel, has been Ducati's worst kept secret in the history of Ducati. With the internet flooded with spy shots of all sorts (one of them even had a Diavel test bike crashed and the rider being taken to medical aids), we all knew how the bike would look in flesh. But as the saying "It's more that it meets the eyes", so, now my curiosity laid, as to what lies beneath that fleshy looking exterior. 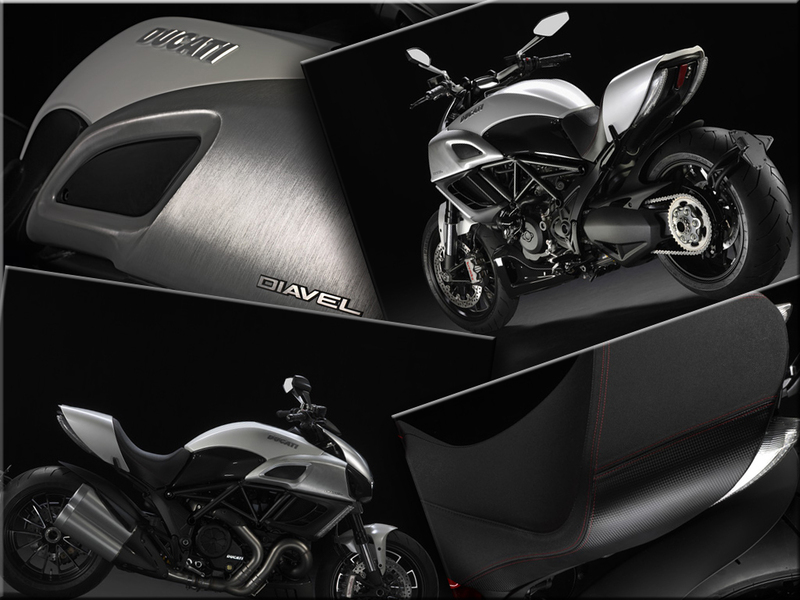 To start with, the Diavel would be available in two variants - the 210.01 kg Diavel, and the 206.83 kg Diavel Carbon with Carbon Fiber body works. No difference on looks and specs though for the two variants. So, let's move on to the other bits. The Diavel's brute force comes from the Testastretta 11 V-twin engine. The 11 in the Testastretta denotes the 11 degree of crankshaft's rotation during which both the exhaust and the intake valves are open. The 11 degree is actually a deviation from the 45 degree found on the 1198 engine doing the job on Ducati's Super bikes in order to optimize intake airflow at the bottom of the exhaust stroke. Producing a top bang of 162 hp @ 8000 rpm and 127.5 Nm Torque @ 9500 rpm, the Diavel is truly on a sports mode and is a deviation from a normal cruiser one might think of it. 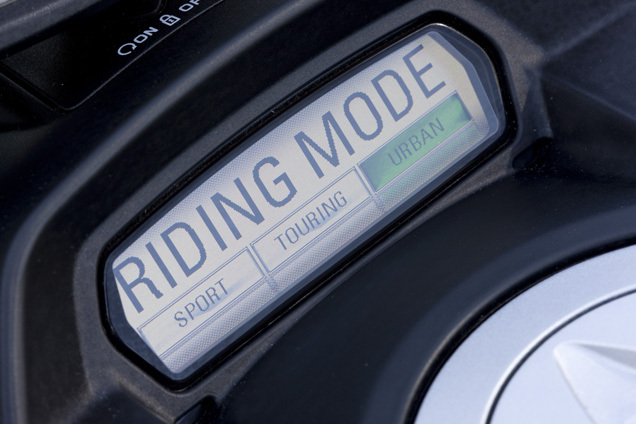 Talking of the Diavel being on the sports mode, the Diavel features 3 Mode Power Drive Mode Selector on the left switch gear and viewed on the Tank Mounted Instrumentation panel. Sport - True 162 hp ballistic. Tour - 162 hp with progressive power delivery. 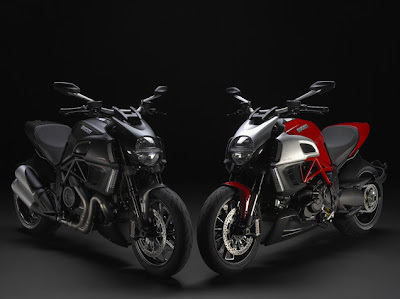 To make the engine response and the riding more sophisticated, the Diavel is comes equipped with the Ducati Traction Control which was up-till now present on Ducati's super bikes, but is not percolating to the street genre. Along with it you get the Ducati Ride by Wire which opens the butterfly valves for optimum power delivery. Apart from the Engine features like the Power Drive Mode Selector ,the Ducati Traction Control, the Ducati Ride by Wire, one of the most primary feature that has been put into the Diavel is the ABS. The Diavel gets the Bosch-Brembo ABS as standard fitment. The front bite is offered by 2x320mm rotors working with 4 piston mono-block Brembo calipers with ABS. 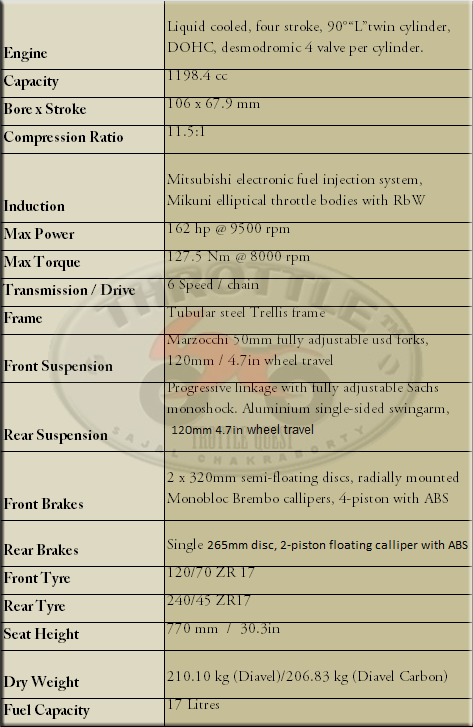 The braking duty down rear is done by 265mm rotors with twin piston Brembo calipers with ABS. The transmission is provided by Ducati's factory Slipper Clutch through a Six-speed gear box providing the final drive to the fat 260mm section tyre through chain. Diavel's chassis geometry is based on the trellis frame withe the rear wheel being support by the single sided swing arm. With at rake angle of 28 degree and a wheel base of 62.6 inches, the Diavel promises to be as comfy as one can imagine for a street fighter cruiser. The front suspension is 50mm Marzocchi forks providing Pre-load, Compression and Rebound adjustments. Down rear the Diavel has Sachs shocks providing 3-way adjustability. it was pretty obvious that the "Spy Shots" were actually a choreographed PR push. But somehow, the Diavel leaves me with mixed feelings. Rightly said, else I've seen no other manufacturer, two or four wheeled guard their secret so loosely!! Even Mahindra did a way better job in guarding the secret of Mojo.